Nicola's Books' Summer Reading Club encourages children to discover the joy of reading. All children K through grade 8 are invited to join. Readers can earn up to five $6.00 Nicola's Books coupons. On the go? 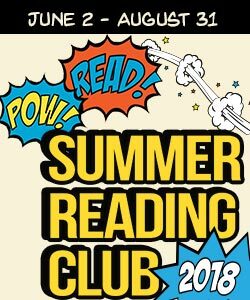 Print out a Summer Reading Club information sheet below and then stop in to register. Nicola's Books is committed to bringing kids and books together. We realize that many of your kindergarten and first grade children are not able to read by themselves. We have an alternative program for those of you who would like to read to your child. Please ask a bookseller for a Read To Me Club form. Nicola's Books invites young readers to join our reading club this summer. Stop in to Nicola's Books to register and get the SRC form. Read any book from your home, library, or bookstore. Use the form to list the title and number of pages for each book that you read. Bring in the completed level, signed by a parent or guardian between June 9 and August 31 and we’ll give you a $6.00 coupon. Earn up to five $6.00 coupons - one for completing each of the five levels. You must turn in a completed form (20 age-appropriate books) to the Summer Reading Club Desk. Coupons may be used to purchase merchandise in the store through October 31, 2018. Coupons must be redeemed in full when used. Read any book over 200 pages and count it as two books. Just write “extra credit” on the line underneath the title of the book. Not sure what to read? We have suggestions! See our recommended reading lists and print off a copy below. The quality and content of these books have made them favorites of readers like you, whether you’re a beginning reader, an intermediate reader, or ready for young adult books. Please remember that books must be age appropriate. We also ask that you help your child choose books that will expand his/her horizons, and encourage their enjoyment of reading. Ask your child about each book they have read and initial your approval! Coupon valid on in-store purchases only. Total amount of coupon must be redeemed at one time. Not redeemable for cash, gift cards or store credit. Valid 6/9/18 - 10/31/18.